Seen in the distance is the biggest fishing village in Bintulu. The Kampung Jepak fishing village has been an icon of Bintulu , which grew from a small fishing village to an industrial town it is now. This transformation happened in just about three decades. 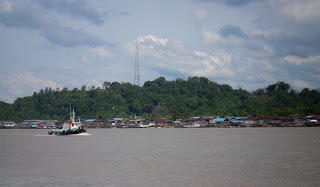 The tall hill forming the backdrop of the village is the Bukit Jepak where a telecommunications tower stands overlooking the fillage.The village is accessible from the main town opposite by boats called ' tambangs' that ply the route on hourly basis. A one way trip would normally cost 50 sen.